Carpet cleaning is a complex science. Each and every carpet stain requires an individual and experienced approach. If either of these factors are forgotten or misjudged then the likelihood is that you will end up with a damaged carpet or poor results. Neither of which is a good thing. It is a true possibility that you if approaching the task with insufficient knowledge that you will end up further damaging your carpet. The stain may well be removed but you will be left with matted, unsightly fibres that can be worse that the appearance of the original stain. This will then mean that you have expended a lot of time and effort to possibly have to replace your carpet anyway. This advice is really related to carpet stain removal. However, general carpet cleaning also follows the same trend. It is really important that when you are cleaning your carpets that a completely even clean is achieved. This really can only be done with professional carpet cleaning equipment. As previously discussed, this needs to be coupled with the correct cleaning formulations and techniques. This picture shows a carpet cleaning job that we completed in Eastcote. With any coloured carpet, a seamless clean plays a pivotal role in the overall success of the work. Once again, the level or dirtying that this particular carpet had experienced only became visible once the carpet cleaning process had started. 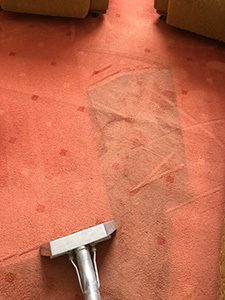 Once our carpet cleaning machine had started to remove the ingrained dirt, it showed the deteriorated state of the remaining areas. At this point our clients usually state how they wished that they had made contact earlier. The pattern of the carpet also became more visible again. Many people live with dirty carpets for far too long. Our cleaning process completed transformed this space and brought back the bright colour of the carpet. Are you looking for a carpet cleaner serving Eastcote? Call today on 0800 695 1118.